"Long time no see ha…?" This painting, created about six yeas ago, belongs to another world, I feel. I never saw it since 2003. I had no photos of it. To me, this looks like an abandoned path. Or a ghost town maybe. My paintings look so different now. I hardly paint this sort of stuff. But still, I enjoyed the revisit a lot. At first I felt nervous, like revisiting a child who ran away several years ago. hehe … This was a special child; It used to be one of my favorite paintings. That’s why I am still concerned about it. 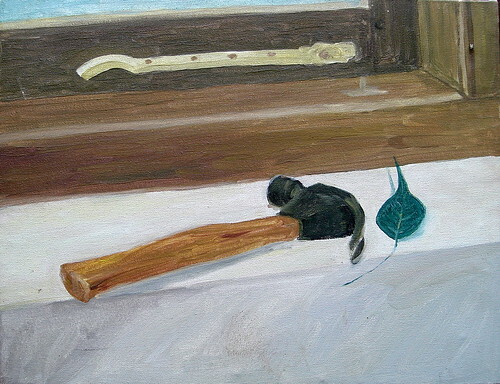 The painting depicts a Bo Leaf with a hammer. The Bo Leaf is an ideologically charged symbol; being closely associated with Buddhism and also with loving-kindness + other softer human qualities, I thought it brings in a very unsettling feeling to the composition. It looks to me as if someone just hammered the Bo Leaf, few seconds before I captured it into the painting. Ah I should not go on babbling about it that much. I have some poor paintings to show you. *not feeling good about most of the stuff* :( arrrgh, but still, what to do if that’s what comes out?